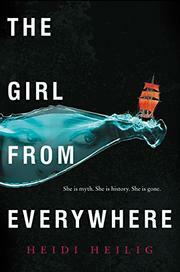 The Girl from Everywhere, by Heidi Heilig (Greenwillow, February 2016) is a young woman named Nix Song, who travels on her father's ship from one time to the next as they sail from map to map. Her father is able to navigate into any place accurately mapped, even if the place is imaginary or mythological (though there's only one shot per map) but the one place he hasn't been able to visit is the year in mid-19th century Hawaii when Nix's mother died while he was off sailing (to get money for their future together that didn't happen). Nix is not at all sure she wants her father to find a map back to that particular time, because it might well change the whole course of her existence to be raised by both mother and father....But Nix doesn't really have any plans of her own, so she goes along with it. A map that promises it is off Hawaii at the right time takes them there...but several years too late for Nix's mother. What follows is a lot of Nix appreciating Hawaii, intermingled with wondering what the point of her life is (I too wondered) and just getting started wondering if she likes Kashmir (a shipmate from the Persia of the Arabian Nights) more than just as a friend (I wondered about this too--it seemed a lot more like a case of proximity than romance). Alongside this is a heist plot (Nix's father makes a deal to steal all the money from the royal treasury, undermining the monarchy, in exchange for another map that really does seem to be the one that will reunite him with his lost love). None of this is really all that interesting, primarily because I did not find Nix to be an interesting, thoughtful, person. And not much was actually Happening either in terms of plot development or character development. For instance, another possible love interest for Nix is thrown into the mix, but it is more a convinent happenstance than a gripping drama. On the other hand, the book showcases Hawaii's natural beauty, with bonus bits of mythology and history; on the other other hand, that isn't really what I wanted from a ship bearing mythological treasures sailing through time from map to map. Things pick up dramatically toward the end, with a visit to the Emperor Qin's tomb (the little pearl eating sea dragon who seemed just a random add on gets to be part of the action). There are twisty revelations revealed that make the whole story more interesting, and the heist goes very wrong in interesting ways. The last fifty pages or so were very good reading! But they came too late to redeem the book as a whole for me. Small thoughts-- I thought it was great that the crew included lesbian cattle herders from Africa, and I enjoyed the brief bits of page time they got. Kashmir, the Persian love interest and handy thief, got on my nerves because he was pretty one note (or two--love interest + thief). He was clearly suffering from the hots for Nix pretty badly but never demonstrated any depth of personality. (Also I had trouble buying "Kashmir" as a Persian name, but maybe it's more plausible than I found it to be). Final thought--although I myself was not engaged by this one, lots of people were. Kirkus, for instance, said "it’s a skillful mashup of science fiction and eclectic mythology, enlivened by vivid sensory detail and moments of emotional and philosophical depth that briefly resonate before dissolving into the next swashbuckling adventure. Kirkus clearly got more romping out of it than I did. Oh well. At least I romped in the last action filled part of the book (I really did like the visit to Emperor Qin's necropolis). Here's another review, at the Book Smugglers. Oh blast! Well, okay, I'll try to temper my expectations. When they said "time-traveling pirates" I basically died of joy, but I guess it's best to go in knowing not to expect a super well-developed cast of characters. I'm with you on this one, Charlotte! And I was feeling very alone. I disliked it for a lot of the same reasons you did, but was also annoyed by the world building. I did feel that if I sat and thought hard about it, everything would fall apart world-building wise. The overlap of fictional worlds and real was perhaps not as solidly constructed as it might have been.